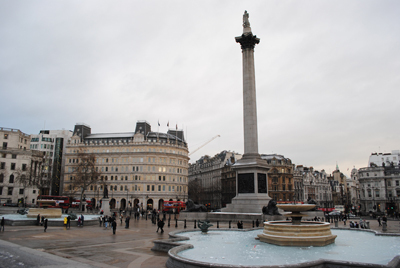 It’s Trafalgar Square but not as we know it. In a new Wednesday series we’re looking at eight proposed structures in London that were never realised and first up, is a proposal which would have seen a 300 foot high pyramid on what has become one of the city’s most iconic sites. The stepped pyramid was the brainchild of an early 19th century Tory MP, Colonel (later General) Sir Frederick William Trench, and was designed in 1815 as a grand military and naval memorial to the Napoleonic Wars with each of the structure’s 22 steps apparently dedicated to a different year of the war. Apparently drawn up by architects Philip and Matthew Cotes Wyatt – of the famous Wyatt architectural dynasty, the pyramid – which would have been taller than St Paul’s Cathedral and pretty much covered the entire space now occupied by the square – was, according to Nick Rennison’s The Book of Lists, costed at £1 million, a figure Sir Frederick – a veteran of the wars – apparently thought was not unreasonable. But it didn’t prove a popular design with the public and got no further than the drawing board. Among Sir Frederick’s other unrealised dreams was an elevated railroad running between London and Hungerford Bridges, an immense new royal palace which would have covered much of the West End, and an embankment – ‘Trench’s Terrace’ – along the north bank of the Thames. An embankment was, of course, later built, but not until after his death in 1859. Famed around the world for her London-based wax museum (and the chain of waxworks which now bears her name), French-born Madame Tussaud is a towering figure of the early 19th century. Born Anna Maria Grosholtz in Strasbourg on 1st December, 1761, Marie Tussaud’s association with waxworks came early when, her father Joseph having apparently died from wounds sustained in the Seven Years War just before her birth, she accompanied her mother Anna Maria Walder to Berne in Switzerland where her mother took up a position as a housekeeper for a physician and anatomical wax sculptor and portraitist Dr Philippe Curtius. In 1765, Dr Curtius moved to pre-Revolutionary Paris where he was soon to open a couple of establishments – at the Palais-Royal and the Boulevard du Temple (later consolidated at the latter site) – displaying his works in wax. Marie, whom Dr Curtius brought to Paris with her mother in 1768, started working with him on wax models and in 1777, at the age of just 16, produced her first wax figure, that of philosopher Voltaire. Other early works of Madame Tussaud’s depicted Rousseau and Benjamin Franklin. The story goes that such was the renown of Tussaud and her “uncle” Dr Curtius, that their social circle came to include members of the Royal Family. Tussaud is widely believed to have been an art tutor to King Louis XVI’s sister Elizabeth and may have even taken up residence at Versailles. Tussaud recounts that she was arrested during the French Revolution – the story goes that she was imprisoned and eventually released thanks to the intervention of family friend and revolutionary Jean-Marie Collot d’Herbois but whether this is true remains a matter of debate. Tussaud claims she was then forced make death masks of those who ended their life on the scaffold including Louis XVI, Marie Antoinette, Marat and Robespierre. When Curtius died in 1794, she inherited his wax works and the following year married an engineer Francois Tussaud with whom she had two sons, Joseph and Francois (later known as Francis). 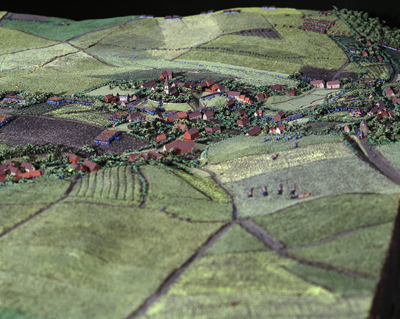 In 1802, Madame Tussaud accepted an invitation to go to London to exhibit her work at the Lyceum Theatre but thanks to the outbreak of the Napoleonic Wars, she and her four-year-old son Joseph were unable to return to France. Separated from her husband, she subsequently spent the next three decades travelling with her exhibition – which included relics from the Revolution and, like those of Curtius, was being constantly updated to reflect current affairs – around Britain and Ireland. 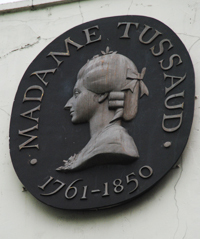 Her son Francois joined her in 1822 and Tussaud continued travelling until 1835 when she first established a permanent exhibition in Baker Street, London. Known as the Baker Street Bazaar, it apparently contained more than 400 wax figures. In 1846, Punch Magazine is credited with having invented the term ‘Chamber of Horrors’ for the room where the relics of the French Revolution were displayed. Tussaud wrote her memoirs in 1838, and, in 1842, completed a wax model of herself. She died in her sleep on 16th April, 1850, in London. Her son Francois became chief artist for the exhibition after her retirement – he was succeeded by his son and then grandson. The exhibition moved to its current site in Marylebone Road in 1884. Now owned by the Merlin Entertainments Group, Madame Tussauds has branches in cities in some 10 countries as well as its London base. Many of her original models still exist and are on display in the London museum along with the exhibition’s oldest attraction – known as ‘Sleeping Beauty’, it dates from 1863 – a breathing likeness of Louis XV’s sleeping mistress Madame du Barry. For more on Madame Tussauds today, see www.madametussauds.com. For more on the life of Madame Tussaud, see Kate Berridge’s book, Waxing Mythical: The Life and Legend of Madame Tussaud .